Whether it’s a winter or summer wardrobe you’re shopping for, nothing transcends the seasons quite like dresses and jumpsuits do. For cute and breezy summer attire, turn to cotton tank dresses in colourful prints and patterns and floral printed playsuits with off-the-shoulder features. For a strong and stylish look to keep them warm when it’s cool, layer maxi dresses and jumpsuits with their favorite denim jacket and an on-trend pair of sneakers. Stock up on staples for their relaxed everyday wear with pieces from our extensive range of girls camis, tanks and t-shirts. From simple singlets and tank tops in a neutral tones and colours to short-sleeve and long-sleeve t-shirts printed with bold patterns and designs, we stock a wide variety of shirts to suit any sprouting style. 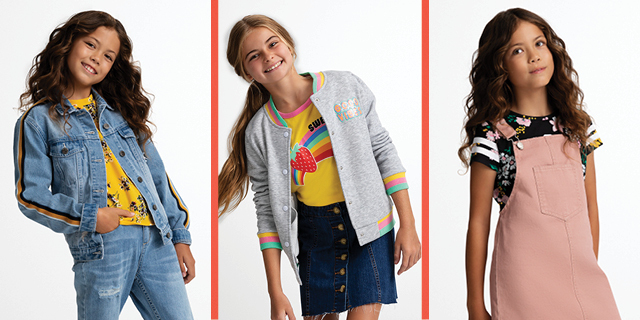 Be sure to complete their look with staples from our girls skirts, shorts and jeans and pants ranges, with adorable everyday essentials spanning from denim shorts and skirts to loose and fitted jeans. Embrace the cooler weather with adorable outerwear pieces from our girls jackets and knitwear range. Whether it’s stylish sherpa jacket fit for a cold afternoon outside or a neutral coloured cardigan to wear over their uniform in autumn, our range of girls jackets and knitwear will keep them snug and secure without all the weight. For relaxed days with family lounging around the house, layer them in items from our range of girls jackets and knitwear. From neutral toned hoodies with front zips and sherpa lining to plain pullover sweaters in a variety of different colours, lounging around has never looked so good. Endorse their love of leisure with all of the essentials, from affordable activewear and leggings to a dazzling range of dancewear. Whether it’s a sweat-absorbent tank top fit for a sports intensive afternoon or a beautiful black leotard to wear beneath their ballet clothes, our range of girls activewear and dancewear will take them from the running track to the studio. For a soft and comfortable option that can be used for either active or everyday wear, utilise leggings in plain and patterned prints. Made of stretchable fabrics with comfort in mind, leggings make a great staple in any growing wardrobe. Add the perfect finishing touches to their look with our adorable range of girls accessories. Coloured caps and beautiful bags are essentials for the school season, whereas a new swimsuit will lend to a summer full of fun. Whether it’s a one piece, tan-kini or bikini that catches their eye, they’ll have all the support they need to swim strong through the summer. When it comes to comfortable shoes and socks, your little one won’t lack choice. Turn to ballet flats in neutral tones and colours for adorable everyday wear, reserving glittered flats and embellished sandals for a more festive flair. Whether it’s comfortable clothing or essential accessories, you’ll find everything your little girl needs to add to her growing sense of style online at Best&Less.